On No is a year old this month. Can you believe it?! What a year it’s been! I remember how it all started, like it was yesterday. Mark and I were up at the crack of dawn (which is our norm) during one of the few times a year that we’re actually in the same state, sitting in his kitchen discussing the idea of generating a conversation about assessment in student affairs and higher education. We simply didn’t know who (if anyone!) would want to participate. We thought, Well if nothing else we’ll just keep doing what we’re doing (which is either talking to each other about assessment or boring our respective significant others with our assessment talk), it’d merely be on a blog instead of via Google Hangout. But you all and our amazing guest bloggers made this year meaningful and brought in much needed topics we had been missing. Wow. THANK YOU all sincerely for reading, liking, reposting/sharing/retweeting, and sharing with us how this thing we love/hate called assessment looks in your world. More guests: You all love reading our guest bloggers (and so do Mark and I). We will have as many as we can get! If you want to write about any assessment aspect (or maybe you know someone who you wish would write a post), PLEASE let us know! More time for simmering (read: less posts): I cannot count the number of people who tell me that they like the blog but they can’t keep up with the volume. WHAT?! You mean constantly talking about assessment 3x/week EVERY week doesn’t endlessly interest you????? Of course not, Abby and Mark! Duh! It can be overwhelming on your limited time (for us too! ), so we’ve already been paring it down considerably. A new look is coming: GET EXCITED!!!! I know we are!!! Oh No is getting a facelift, so stay tuned! Again, we cannot thank you all enough for reading and engaging in this assessment conversation with us. It’s so much more fun with you! Cheers to another year! 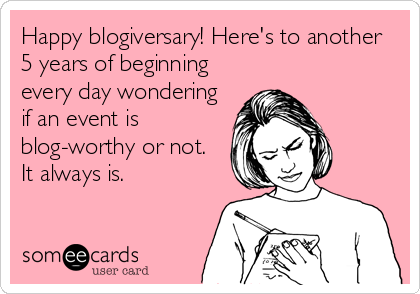 This entry was posted in by Abby C. Trout and tagged Blogiversary, More than usual posts, Who are these people?! by ohnoitsanassessmentblog. Bookmark the permalink.